I was requested to do a painting tutorial, so here is documentation of my progress over a Caramel resin Charo during last week. Note that the doll is not entirely finished yet, but I will post more as I progress. I have different ways of working for different projects. When I don\t have a specific look in mind I usually start by blushing to enhance the three dimensional shape of the face. However, when attempting to capture a specific look (This Charo is inspired by delightfully androgynous looks of Ruby Rose) it helps to sketch the face out to find likeness, and for that I use light brown watercolour. This way I can just wash the face clean if I mess up, and try again. Painting look-a-likes is always more time consuming than freehand painted faceups, so I generally charge extra for the service. When I have found the right look I soften the lines and seal it with Mr.Super Clear UV Cut Flat spray. 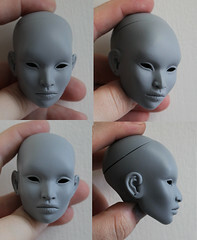 Some dolls have sculpted eyebrows, but when hand sculpting the Inamorata head sculpts I wanted to keep the canvas as emotionally versatile as possible. Our eyebrows communicate huge amounts of information about our mood and personality and I enjoy getting as many different looks out of a head sculpt as possible. Scraping the hairs into an eyebrow to create more textured look and finer lines that I can accomplish with a brush alone is a technique I have only recently began to explore. 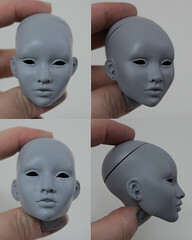 I love the look it gives the doll, although it limits the expression if the dolls is to be repainted in the future. I use a hobby knife blade without a handle for better accuracy and scratch the hairs into the brows. It is wonderful to study how different the look of the brows is even though the shape of the brows remains the same but the direction of the hairs changes. For contouring the cheeks, chin, nose and forehead I use pastel dust. I generally mix my own colours by scraping Rembrandt pastels into fine dust into a palette or small boxes. I also use PanPastels, metallic pigments and powder form eyeshadows from MAC and Makeup Store. In body blushing and contouring I use 2-3 different shades: usually a cool slightly darker shade for shadows, and a warmer shade for highlights. For example for Milk resin these shades a copper oxide green for shade and pale rose pink for highlights. For a natural look on Milk resin, I dust under eyes with slightly purple toned down shade, because that is closest to my own pallid complexion. However, for the makeup here I used light brown under the eyes and black pastel above the lid, natural hues on the lips and dark brown of the brows. 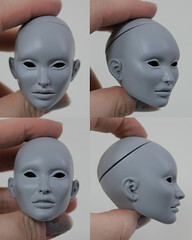 Building the pastel part of the faceup may take several layers and I seal each phase with UV coating. After the messy pastel base is done I paint eyes and other final details last, using acrylics and a fine brush. The acrylics brands I use are Vallejo Game Color and Games Workshop Citadel. As brushes age and lose their accuracy, I cut them down to make tiny make up brushes for applying the pastel dust pigments. I paint the entire eye white first, then the iris, often mixing diluted acrylics while wet on the iris itself to create more interesting colour fluctuations. If the sculpts has open mouth, this is when I paint the teeth. Charo and Nnaji have sculpted upper teeth, but I like playing with the expression by painting a line of white underneath to give an impression of lower teeth. Or a line of pink as if the tip of the tongue was visible, just about to lick the teeth. These little variations change the mood of the doll hugely. With diluted acrylics I add feathery detail to the eyebrows, sometimes draw lower lashes, add a feint lighter lip liner to make the lips pop, etc. I often apply the eyeliner inside the sculpted eye, to the deep grooves or waterline sculpted in Inamorata eyes. 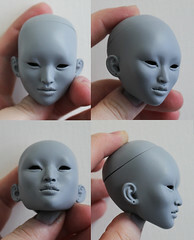 I find this gives a more natural effect although it depends on the sculpt too. The older sculpts like Charo and Nnaji have quite huge eyes, so I tend to paint them smaller for more realistic portions, but the three new sculpts: Midori, Nubia and Valerie have smaller eyes, so I often use the “liquid eyeline” (acrylic) on the upper eyelid too to reshape the eyes, just like I was applying make up on my own eyes. I often prefer to use just pastels on the lips for a more natural effect, but for lipstick I use acrylics as a solid colour, or often adding lip lines to emphasize the texture. I am really not a fan of solid colour lips as always feel I could had done more with them, they feel unfinished and somewhat playline. To make this feature more interesting I sculpted the Inamorata heads with lip wrinkles and very distinct lip shapes, so even a solid coating of paint with a gloss varnish will bring out an interesting landscape of details when studied up close. I often use aquarelle pens to draw finer detail on the face. Lower lashes, feathery hairs of eyebrows, wrinkles of the lips, and a fine line of highlight in a shade lighter than the skin tone on the amor’s bow on the upper lip, right under the wing of the brow and a glint of light on the waterline of the eye to extend the tear duct. These pens are great for finding the right spot of a beauty mark, as you can just safely wipe them off with a moist Q-tip if you have sealed all the layers below with UV spray. One of the finishing touches is gloss varnish. I usually apply it on the naturally moist parts of human skin: the eyes and lips. Lips can have a full gloss coating as if from a make up, or for a matte look, just a hint of moisture between the lips. For eyes I apply the varnish on the waterline and tear ducts as well, and rarely a diluted solution over the eyelid if the eyeshadow benefits from the look. I use human size lashes I cut down to right size and length, including the tapering them down towards inner corners of the eyes. I use a toothpick to roll the lash ribbon into shape before using a gel type glue meant for crystals and watch parts. Do not use superglue! It will harden the lashes and they’ll get snagged into clothes and come off, often pealing paint with them and ruining the doll. While holding the lashes with tweezers I put a tiny bit of the glue on the lash ribbon and slip the lashes underneath the upper eyelid where Inamorata have a deep sculpted groove for the lashes. The groove helps the lashes stay in place, keep their shape and hide the thick lash ribbon and any glue residue from view. I use a toothpick to press the lashes deep in the groove, especially holding down the ends. Then I use a fingernail to press up the lashes to a chosen position and let the glue dry. After its dried I apply the final layer of eyeliner, morphing the lashes to the eyelid with acrylics. There are some pretty awesome and adorable 3D printed pets out there, such as Helga Reinhart’s elegant PureBred orientals and super adorable OLEUM aka Eve the Cat pets in ever increasing varieties of cats, dogs, rabbits, snakes and dragons. There are many others, but these two brands are the ones I’ve had the pleasure to paint. Both offer ready made (painted and assembled) BJD pets, as well as cheaper raw kits, where you get the fresh out of the 3D printer white plastic parts to process, paint and assemble. I specialize in painting intricately patterned cats and imitating a fur like texture. It’s a time consuming process of layering colours and I’ll explain the process step by step so you can try it at home. I recommend trying with some inexpensive items first, as these raw kits are still pricey art works and because of the porous texture of the plastic it’s hard to fix mistakes. Painting 3D plastic is very similar to ink painting on rice paper. You can only cover something with a darker ink. *Before handling the kit, make sure you have clean hands. The oils in your skin can leave fingerprint stains that change the way the paint is absorbed. I use surgical gloves while working as acrylics stain skin as well. When you get your kit it looks like a jumble of random parts. Make sure you got all the parts right away, especially that every part has a left and right, instead of two left feet. This can be a bit of a challenge especially for Helga Reinhart cats as there are no assembly guides. You just have to look at the photos on the website to puzzle the cat jigsaw together. Next you want to check the parts for rough textures and make sure the holes inside the parts are clear. I often have to drill the holes bigger to make space for the hooked wire I use for stringing the parts in the end. You can also do this after the painting, but it risks damaging the paint surface and you might need some touch ups after. Sometimes external surfaces need a bit of sanding too as 3D printing leaves a coarse texture to the raw kits. Most of the time I really like the texture, as it fives the surface a fuzzy look that works well for furry pets. However, on the top of the parts such as head you can sometimes see clear pixels and I soften this spot with smooth sand paper. Note that the raw kits can be very dusty with loose powder inside the parts, so I recommend wearing a breathing mask for the prepping stage. To clear the polyamide powder inside the parts and off the surface, wash the parts by submerging them in water and soak them in water overnight. The next step is the base painting. This is similar to wash in aquarelle painting. Get you wet 3D parts from their overnight bath and place them on a paper towel to dry. Use water based artist acrylics and dilute them with water to create an ink that you can brush as base paint. I use a tiny piece of sponge on bigger areas and a clean moist one to blend. I add several layers of gradient effect with a brush, building from lighter to darker shades. Let the parts dry over night before adding detail. When the parts are dry I recommend arranging the unassembled kit in somewhat whole form so that the pattern size and shape flow naturally. In the picture below I actually got the left shoulder part in the right socket, but happily it did not ruin the painting. Using highly diluted acrylics (maybe 80% water 20% paint) I paint the rough patterns. The more diluted the paint, the harder it is to control, but the seeping effect creates a nice blurry edge that looks more natural. Hardest part is getting the face symmetrical, but since cats often have asymmetric patterns one shouldn’t obsess over this detail so much. Let dry completely before the next step. You could stop here, but for extra realism and fluffiness I recommend painting individual hairs to create a fur like texture. When your patterns are dry, dilute the paint less than before (maybe only 60% water or so) and use a tiny brush to start texturing. I use the same shade or a shade darker to paint over the patterns, keeping in mind the natural direction and length of the fur. This is a lot of work. Honestly, you may spend days doing it, but it is worth it. When you are done, let your pet dry overnight and you finally get to string it together. Eve the Cat happily has video tutorials for few different animals so I will simply link a polyamine cat assembly video here for you to see. Even if your pet is different from this you will get a good idea of the principles and tricks to be applied to other forms. A final touch of realism is to use a tiny hand drill to make holes and glue whiskers into them. Click the links for more photos of Eve the Cat and Helga Reinhart 3D pets I have painted. The Flickr photos tell you the brand and size of the raw kits used. Note that all the dolls I paint are OOAK and I cannot make exact copies. Each cat has it’s own personality and coloring. No two are alike. You can commission Emilia to paint a OOAK pet for you. If you want to commission a pet email her inspiration pictures of the look you want. For a perfect miniature of your fur baby send pics of their face, sides, back, tummy, paws and tail. When you order the 3D printed pet from the brand of your choosing, you can have the kit ship directly to her address to save in shipping costs. Helga Reinhart cats can be ordered with two heads with differetn expressions. Painting and extra head is 100usd more. Adding whiskers is 50usd more per head regardless of the size. The technique works better for larger pets. 5cm Eve the Cat has too small face for the drilled holes. Contact Emilia for inquiries or use the simplified ORDER FORM 2 for initial commission order, you can attach inspiration photos to the email correspondence later. One of my favourite things in painting dolls is to use layers to create lifelike skin so translucent and textured that it is almost as if the doll is just holding their breath, ready to gasp to life at any moment. Dénear – One of the OOAK Siren twins, Inamorata 2.0. with hyper realistic body blushing, freckles and strobing. This means multi hue base. To give Milk skin that feel of translucence I use pale copper oxide green, powder pink and faint lavender. Between the layers I might draw blue blood vessels, on top freckles, moles, scars and tattoos. It’s a mixed media of aquarelles, pencils, acrylics, pastels and other pigments. I often use loose pigment powders made for human makeup such as the ones from Make Up Store and MAC. Each layer is sealed with thin spray of Mr. Super Clear UV Cut Flat sealant and each doll has 5-10 layers depending on the level of detail. I also love deep dark skin tone, although dark resin is always harder to work with, but I find the glow of dark skin and the paler palms and soles of absolutely stunning. For tattoos I often use aquarelle pencils sealed with UV spray. If the tattoo is meant to look fresh I use darker, more vibrant colours; if the tattoo is worn and old, the colours are faded and I do the body blushing over them for a more authentic feel. I’ve always loved tattoos and for two years I have been planning a collection of tattooed dolls, each OOAK representing a tradition of body art. My favourite has always been the Japanese Irezumi, an aesthetic heavily influenced by the ukiyo-e wood prints, and associated with yakuza. The other body art traditions represented could be Russian Bratva prison tattoos, American traditional, Indian henna, tribal scarification and Viking warrior. 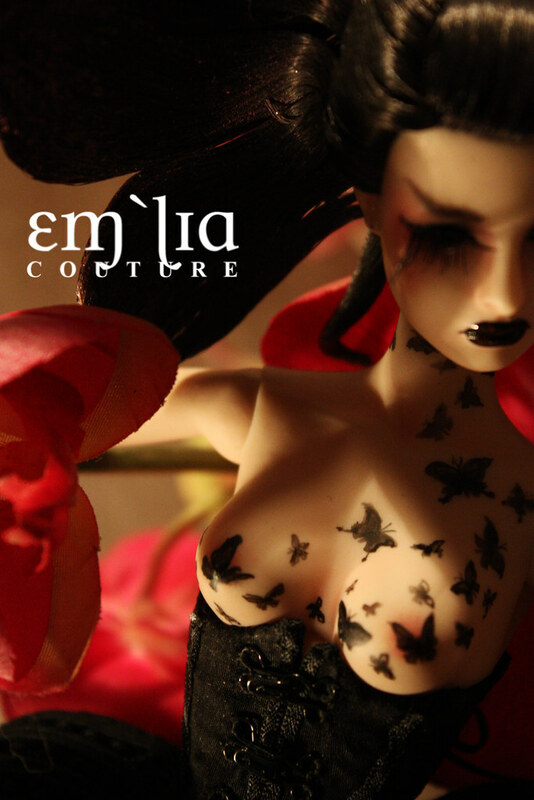 I am also interested in exploring bruises, scars, piercing and other body modifications in dolls. I was a tomboy of a child with constantly scraped knees, that grew into martial artist naming her bruises after the person who gave them to me. I consider scars and wrinkles as a part of a person’s life story written on their skin and all of it is beautiful, even if painful, because life carves depth into our souls. Hence, making dolls that show aging, bruises and scars is a wonderful way to tell story. It is what makes the dolls, and this work, interesting. You can find examples of commission prices for OOAK Inamorata dolls and other doll commissions here. Hyper realistic body blushing is 100usd. Tattoo work depends much on the scale and detail, but estimate for a small individual tattoo is 50usd, and larger sleeves or full body tattoos need to be priced case by case. Same goes for leaf “gold” accents. A detailed full body Irezumi style tattoos start at 500usd. 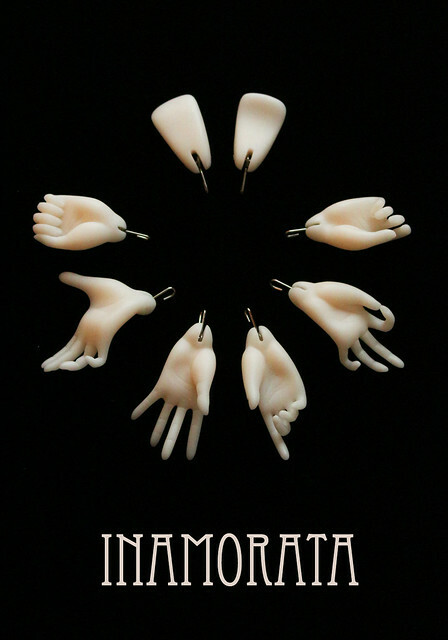 Each Inamorata doll comes with a set of 8 hands. Three of the pairs are elegantly expressive hands for holding objects, editorial posing and even dancing. One pair is dressing hands that help you slip into the tightest sleeves without a fuss. The Inamorata hands system is easy to change and the different sculpts with ball joints centered or pointing up/down will add variety of poses to your doll’s repertoire. The hands are easily exchanged by hooks that latch on to the elastic cord inside the arms. The important thing is just to keep the old hand attached until you hook in the new one so that the elastic cord won’t escape inside the arm. Also, ease the hands to their place slowly as the snap back might damage the resin.